The DuPage County Health Department is advising residents to enjoy the outdoors this Labor Day weekend, but to ensure protection against mosquitoes. 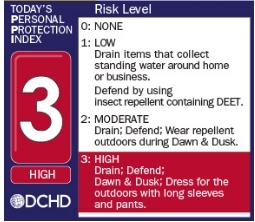 The Health Department's WNV Personal Protection Index is at Level 3 (high risk) due to the number of mosquito batches testing positive for WNV. Level 3 indicates high numbers of infected mosquitoes in most areas. Dusk to Dawn, wear repellant when mosquitoes are most active.